"Fowl is Fare is a documentary showing how Long Island ducks are prepared for market. 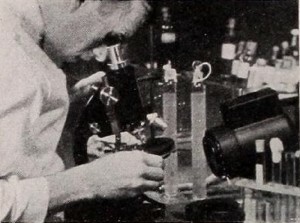 Unusual angles and tight editing keep the film moving" PSA Journal, Aug. 1967, 37. "Freedom of Choice features Jack Ruddell's flawless camera work and concerns the problem of the meat packer in determining why a housewife will select one package of meat over another. A well planned production" PSA Journal, Sept. 1964, 51. "Reel Meal concerns the life of one meat ball, and is filmed to fit the tune of "On Top of Old Smokey." As a chorus sings specifically written words about one poor meat ball that got away, the scenes, cut to fit, record the antics of the fugitive from a plate of steaming spaghetti. A refreshing novelty well done" PSA Journal, Sept. 1964, 51. "This story of a loaf of bread begins with the plowing of the ground. It continues thru discing and harrowing. Then come fields of waving wheat; the harvest and the threshing; the journey to the grain elevator and the flour mills. Scenes in a modern bakery follow and from there the bread is sent to the retail store. Children eating bread and jam are representative of the 'ultimate consumer'." Educational Film Catalog, 1937 edition, 80. "Blossom Forth the Fruit is a straightforward, well made, carefully planned and well exposed instructional film, which tells how to care for apple trees and their fruit in all stages of growth. 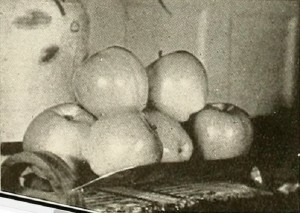 Its maker, William R. Hutchinson, has a thorough knowledge of apple growing, and he also had the collaboration of specialists from Cornell University and the Farm Bureau. The clear presentation of all the phases of treatment that are necessary to insure the growth of fine fruit is noteworthy. From the technical point of view, microscopic color studies of insects, parasites and blights furnish excellent examples of ultra closeup technique. Methods of spraying and other protective treatment of the fruit are shown in clearly presented detail. Because of its clear presentation and uniformly high technical quality, this film is worthy of the highest commendation." Movie Makers, Dec. 1941, 564-565. "Within the brief confines of Lady on June Street, Leo Caloia presents a satisfying example of the personality film worked out in story form. Faced with the common problem of family filming, he has resolved the riddle with imagination, humor and marked cinematic ability. The "lady" in question is pictured as a lazy, luxury loving wife, spiritually eager to be the best of helpmates, but physically enslaved to satins and sweetmeats. 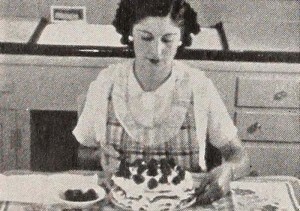 Dozing, as she regards with languorous ambition an advertisement for homemade shortcake, she dreams vividly of a sweet but unaccustomed success with pot and pan. Crash! In her dream, the lady slips, and her magnificent shortcake slithers across the kitchen linoleum. Bump! In reality, she has rolled sleepily from her couch, to awake with a thud on the living room floor. 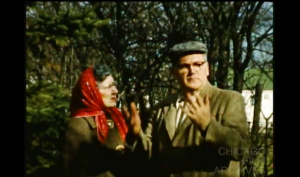 The film fades swiftly as she hurries the tops off canned beans and sauerkraut." Movie Makers, Dec. 1939, 632. "An achieved simplicity in presenting a complex idea is the outstanding accomplishment that wins for the National Oil Products Company an honorable mention for its film. This picture presents the necessity for Vitamin "D" in the food of children and gives the highlights of preparing the Nopco product containing this essential food element. 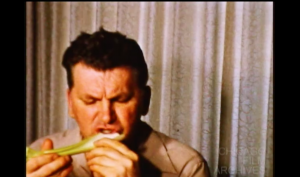 This picture, directed by Ralph Wechsler and photographed by Arnold M. Hill, ACL, follows the safely conventional presentation of industrial film messages in its continuity methods, its use of animated diagrams and its description of ultimate consumer usage. Working within this pattern, the makers of the picture have done extraordinarily well whatever they attempted. The continuity flows so smoothly as to be unperceived unless by a critically inclined observer; the animated diagrams are clear, well executed and strictly limited to the bare necessities of making the idea entirely evident; the photography is unexceptionable in nearly one hundred per cent of the film. This product of the joint efforts of an intelligent director, a very capable cinematographer and a fully cooperating industrial concern shows how perfect a practical film may be if real care is devoted to its making." Movie Makers, Dec. 1933, 522-523.